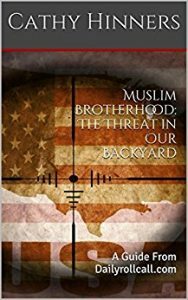 While masses of Americans (sheep) continue to be blind and embrace Muslims and their ideology, their true intentions are now, more than ever open for all to see. That is, if you open your eyes to truth. One of the most perilous events to occur this year was the election of two Muslim women to the U.S Congress. Rashida Tlaib and Ilhan Omar pledged allegiance to their own beliefs rather than those of the Constitution by being sworn in on Qurans. The same Quran that in over 109 Suras (verses) calls for war and the destruction of non-Muslims. Quran (9:30) – “And the Jews say: Ezra is the son of Allah; and the Christians say: The Messiah is the son of Allah; these are the words of their mouths; they imitate the saying of those who disbelieved before; may Allah destroy them; how they are turned away! Yes, this is the book Muslims took their oath of office on. Now that they are entrenched in our political system, they are comfortable with showing their true colors. 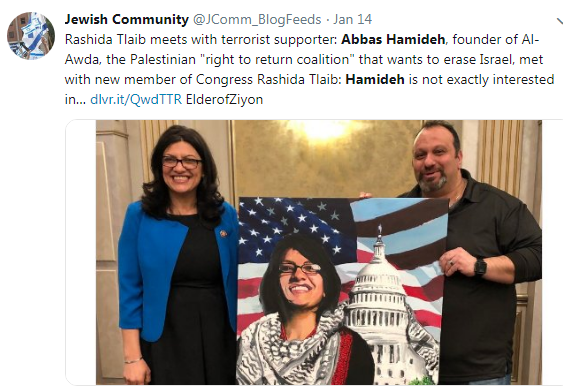 Rashida Tlaib, who hails from Michigan, and is Palestinian, stands with Hezbollah terrorist supporter Abbas Hamideh. Hezbollah is a Shi’a Islamist political party and militant group based in Lebanon whose intended goal is for the annihilation of Israel and the United States. There is a long list of terrorist organization connections to this treasonous woman. CAIR is Hamas, and ISNA, the MSA, ICNA, and MPAC are Muslim Brotherhood. In addition to Tlaib and her “sister” Ilhan Omar, the following is a list of Islamists from their respective states that won elections. With a stated goal of “destroying Western civilization from within” it shouldn’t be hard to see that is exactly what they are doing. This excerpt is taken from a document entered into evidence during a federal trial in TX. The same is true for the United States. They don’t need to use violence, we are handing them our country on a silver platter. Thank you for all you are doing for America! As I observe so many nations slowly being strangled from mismanagement and falsity, it is refreshing to hear you on radio or read postings. BTW, there is no such word as “irregardless”. I am originally from the mid-west and was totally used to hearing and using it myself. Opt for “regardless” instead. Cheers!